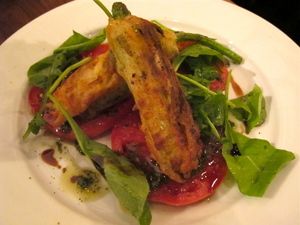 Fried squash blossoms with goat cheese. Red butter lettuce with Green Goddess dressing. 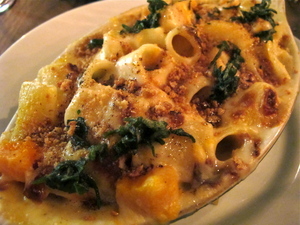 Baked rigatoni with butternut squash, brown butter, sage, and Fontina (yeah, pure evil). Amatriciana pizza; photo by Nick Vasilopoulos. 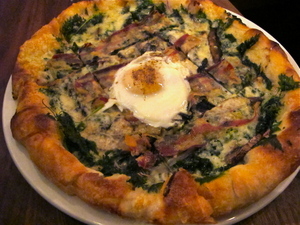 Wild nettle pizza (with an egg). Interior (at the end of service). I just finished eating a lunch of leftover wild nettle pizza from ~RAGAZZA~, and in the words of James Brown, I jumped back and wanted to kiss myself. I mean, really, are there two finer words in succession than “leftover pizza?” But then there’s “tax refund.” Oh, and “open bar.” And let’s not forget “conjugal visit.” Since I don’t need to worry so much about the latter duo (whew), let’s just focus on the first: leftover pizza. It’s shocking that I even had some leftover pizza after a dinner at Ragazza, but I find it impossible to be sensible and just get one pizza each time I eat there. My table gets covered with two pies, every visit. The extensive menu practically demands pizza polyamory. Chef-owner Sharon Ardiana already earned a citywide legion of fans at her popular Glen Park pizzeria, Gialina. Come on now, what else is going to get me to schlep out to Glen Park? Many other folks in this town can concur—Gialina is like a pizza-lover’s lighthouse. So I was beyond thrilled to learn Ardiana was opening her second pizzeria in the Lower Haight/NOPA neighborhood, just blocks from my apartment. Dangerously close. 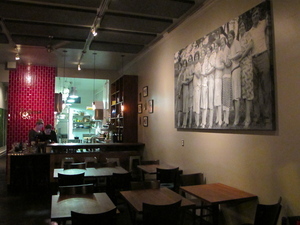 Ragazza opened in the fall of 2010, and Ardiana acquired a cherry-red, Wood Stone fire deck oven for the location. It was a new oven to the team, and while the pizzas were good in the beginning, now they’re tasting really, really good. Like, in the pocket. These pizzas are not the Gialina pizzas: at Gialina, they have to cook longer in the Baker’s Pride deck oven, so the crust is crisper. The Ragazza pies have more of a shattering quality around the cornicione (the lip) since they cook at a higher heat and much more quickly; the dough also has a different kind of elasticity. I’m a fan. I have to literally force myself to try something other than the amatriciana each time, but it’s no surprise to me that my favorite pasta preparation would equate to my favorite pizza topping. 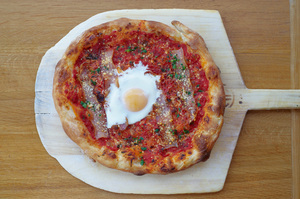 Here, the amatriciana ($16) comes with tomato, Boccalone pancetta, chiles, pecorino, and a custardy farm egg in the middle. I wouldn’t change a single damn thing. One of my very favorite pizzas in the city, period. The wild nettle pizza ($17) is a pie I first started ordering at Gialina, although this version comes with red onion, Boccalone pancetta, portobello mushroom, and aged provolone. I strongly recommend an egg on this one—it totally brings all the flavors home. (Go ahead, you can call me Marcia “put an egg on it” Gagliardi.) And don’t miss a side order of the spicy Calabrian chiles ($1.50)—I like to drizzle it all over the pizza, especially this one. But I wonder if the mushroom is even needed on the pizza—it actually distracts. The kitchen pays close attention to the seasons, and the recent arrival of heirloom tomatoes was heralded on a pizza that came with slices of ripe Mariquita tomatoes on top, with a base of smoky bacon and mozzarella, plus fragrant green notes from arugula and basil. As my sister noted, it’s the BLT of pizzas, and I’ll be damned if it wasn’t on both of the tables to our left and right, and ours. The way the cheese melted on the golden lip of the pizza made it taste like a cheesy breadstick. Even people who normally don’t finish their crust will power through this crust. Now, Ragazza is not just a pizza place. You’ll definitely want to start with one of Ardiana’s salads. (Listen to your mother! Eat your greens!) 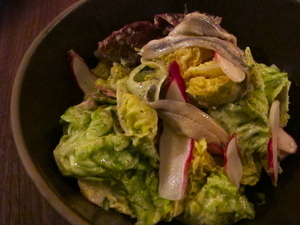 The Green Goddess dressing ($9/$18) is refreshing and creamy, generously coating tender red butter lettuce leaves, with additions of shaved fennel, thinly sliced radish, and a few plump white anchovies. (Don’t want the anchovies? Fine, I’ll eat them!). There are always a few seasonal components to this mainstay salad: I’ve had it with little gems, farro, and apple, and in the winter, it had fennel and sunchokes with chicories. Get it. You’ll most likely be tempted by at least one of the appetizers, ranging from oven-roasted sardines ($9) with a Sicilian-style stuffing of breadcrumbs, sultanas, and the kick of peperoncino, to a recent special of squash blossoms ($11) filled with goat cheese and chives on a bed of sliced heirlooms (that special ran out fast). There’s an antipasto plate ($11) with house-pickled vegetables like green tomatoes and green beans, and currently features a unique pancetta cotto (delicious with a dollop of the New York mustard Ardiana gets). In case you are in a “no carb left behind” frame of mind (to borrow from Eat, Pray, Love), there’s always a pasta on the menu. During the winter, there was a SICK dish of baked rigatoni ($12) with butternut squash, brown sugar, sage, and Fontina cheese. Thank God I have to wait until November for that bad boy again, mamma mia. I’ll need many hours running stairs before I’m ready to take it on. Ardiana also loves pork belly, which shows up in appetizers or larger dishes—I know, just pace yourself. The menu highlights quality ingredients at the peak of freshness, so you’ll always see dishes rotating on and off. Desserts include some Bi-Rite Creamery flavors ($6), but if you can hack it, I’d steer you to the ricotta cheesecake ($7), which actually isn’t all that heavy (thanks to the addition of a bit of cream cheese)—and a touch of lemon gives it even more lift. 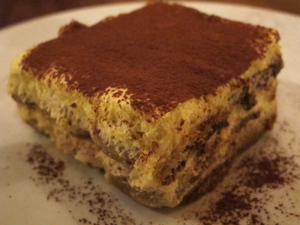 Tiramisu ($8) is a dessert soundly ruined in restaurants around the world (I can’t believe I once saw a version with chocolate sauce, the horror), but what I like about the execution here is it’s not the over-soaked and sloppy mess I usually encounter—you can actually see the dimension of the ladyfingers, and it has a lighter, cakey texture to it. Some like a more-soaked version; to each his own, and I’ll take this one, thanks. So, with this bounty of good food and flavor, of course there are some trade-offs, like the fact you can’t make a reservation. And during peak times, there will be a wait (even up to an hour). Fortunately you can put your name down and toodle over to The Page across Divisadero or Vinyl Wine Bar just up the street, and the host will call you on your cell when it’s time to strap your feedbag on. And coming very soon will be some primo patio seating in the back, which should help with the wait times. And there’s always take-out! Another ding: the tables are super close together, so when you need to sit or get up from your table, your neighbors may need to do a little table jostling to accommodate your heinie. Whatever, it reminds me of some tight New York places, and the moment of egregious egress lasts a total of three seconds, but some people really want their space. Just think: it’s one extra table in the room so you get seated more quickly. It’s a casual neighborhood place with style, featuring black walnut tables, pendant lamps made of Weck jars, cheerful red tiling in the back, and well-chosen flatware and stemmed glasses (versus the bistro glasses at Gialina). The wine list is all-Italian, which speaks to me, but might leave some feeling a bit out of their element. Not for long—the servers are quick with good recommendations. And I appreciate the carafe option, all food-friendly wines falling in the $23-$33 range. The crowd is more family-oriented when the place first opens, and then seems to average out into a lively 30-something scene as the night goes on. The vibe is energetic, and so is the volume. Speaking of perky, see all the ladies lined up in the large photograph on the wall, grinning in their drop-waist 20s dresses and bob haircuts? It’s a great family picture—and also offers a clue to the meaning of the name of the restaurant: ragazza, which is Italian for “girl.” It’s a salute to all the ladies in the house, the ladies, the ladies!